Here is a Very Famous Elephant and its Author’s Son Who Never Falls Far From the Legacy Tree! Did you know that today, I was reminded by none other than picture book legend, Tomie de Paola, via an art-mail that today, in 1925, was the birth date of Laurent de Brunhoff? He is the son of Jean de Brunhoff, creator of the pachyderm named Babar that children have listened and cuddled up to, in both picture book and physical form, for generations. So, I think it entirely appropriate to feature one of Laurent’s picture books that both features, and continues, the long and illustrious legacy of Babar’s own children named Flora, Pom and Alexander…and the Wully-Wully! Have you or your children ever seen a Wully-Wully, much less had one for a pet? Probably you haven’t unless you’ve been fortunate enough to discover the Babar books! They’re classic picture books written initially by Jean de Brunhoff, writer and illustrator, and after his death, by his son, Laurent. Originally, Cecile, Jean’s wife, imagined Babar, this quite extraordinary, noble and debonair elephant, as a bedtime story for their first two sons. And what, pray tell, is the name of the woman the noble King Babar eventually meets and marries? Why, a very pretty pachyderm named Celeste, of course! Art does imitate life it seems. Bringing to life the whimsical and wise inhabitants of Celesteville, wherein reigns King Babar, the very human and nattily dressed pachyderm, his wife Celeste and their three offspring, Pom, Flora and Alexander, the books’ story lines and illustrations are rich and highly readable – especially aloud, which is what I love to do at my story hours. Arthur, the children’s cousin, is ever present, as well as Zephir, the monkey. Adventures abound for all and life lessons are dispensed and confrontations of all sorts solved, especially when they involve that rascally rhino, Rataxes, who is always ready for a rhino dust up! And here, the dust up is initiated by the discovery by the children of that most rare of creatures – a Wully-Wully! Oh, so you’ve seen them too! The cute Wully-Wully loves hide-and seek, train sets, eating with the family and oh yes, he can play a mean sax too! Enter Rataxes. And it seems he, too, is a BIG fan of the Wully-Wully and a believer in the “possession is nine tenths of the law” theory signaled by the shout, “That Wully-Wully is mine now!” Seems Rataxes needs an adult time out or, at the very least, a lesson in sharing. It’s cousin Arthur to the rescue! But, what happens when Rataxes and his rhino band capture Arthur too? No worries. The light-footed and agile escape artist, Zephir, the monkey, neatly manages the rescue of BOTH! Bigger problems ensue when the rhino, Rataxes, discovers the loss of his Wully-Wully. Can an all out pachyderm/rhino war be averted in time? “You don’t keep friends by locking them up.” Flora explained. “That’s an interesting idea,” said Rataxes. Conflict resolution should definitely be included in young Flora’s skill set resume as she is a master of diplomatic deftness with a touch that is not patronizing and very pragmatic. Plus, she is bold enough to confront Rataxes on his own turf! When war hangs in the balance, she takes things into her own hands and is unafraid to speak from her child’s view of matters to the recalcitrant rhino. 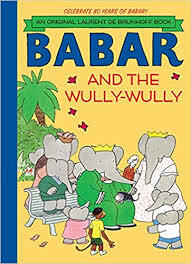 Babar and the Wully-Wully is a picture book that had fallen off my radar screen of classic picture books. It should definitely pop up on yours. Young readers will love it.